Punjab Examination Commission announces the primary class results in last week of March every year. 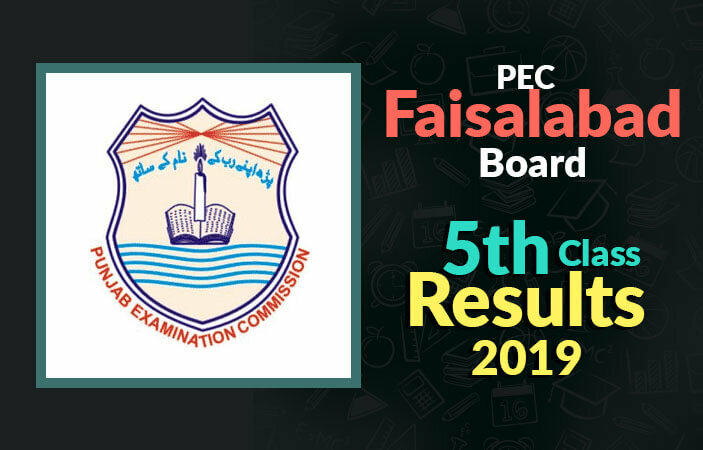 BISE Faisalabad Board 5th Class Result 2019 is going to be made public on 31st March 2019 by the PEC. Faisalabad Board conducts fifth class examination on the behalf of PEC in Faisalabad and its affiliated districts. Everything from starting till the end of the exams is supervised by PEC with the help of Faisalabad board and now soon they are going to declare the annual results for this year. Stay in touch with our site for updates. Students who took the 5th class examination are very worried. They appeared for the exams in February this year. Parents in Faisalabad are waiting for their children’s BISE 5th Class Result 2019. Along with Faisalabad, the other districts in which the exams took place and now the results are going to be announced are District Jhang, Chiniot, and Toba Tek Singh. It has been just a month since the examinations ended, but the compilation of the results is underway and soon it will be complete. As the results are going to be declared on March 31 2019 in each and every district under the supervision of Faisalabad Board. BeEducated will be there for you this time as well. We will provide your 5th Class Result 2019 Faisalabad Board right after it is announced by the Punjab Examination Commission on 31st of March 2019. You can know your result by entering your Roll Number on our site. Once you have entered the roll number your correct result will be shown to you with in a moment. So keep on visiting our website for more details on the results. We have many other helpful material available on our site, surf it more to know better.